The Lock-it Block-it is a new home security burglar bar that sits in your window track and blocks windows from being forced open. Block burglars and criminals from breaking in. Prevent children from falling out. Now you can keep your windows open and feel safer. The weakest link to any home is the window. The more windows your home has, the more at risk you are. An astonishing 25% - 30% of home break-ins occur through windows. And why not? We enjoy having our windows open. We like the fresh air. We enjoy the breeze. We like the coolness of the night while we sleep. Even our pets like the open windows. We also like the freedom of living comfortably in the safety of our homes. Unfortunately, there's a price to pay for that freedom. An open window invites crime…even in the best of neighborhoods. Many of us live with a false sense of security that our neighborhoods are safe because we have good neighbors, a dog, an alarm system, or we live in suburbia. The truth is over 4 million burglaries occur each year. According to the FBI, a burglary occurs every 12 to 15 seconds. On average, at least 1 out every 10 home is burglarized each year – in cities and suburbs. Criminal aren't just stealing TVs and computers, they're stealing appliances and your personal information. What is more disturbing – 60% of all rapes occur to women who are in their homes during a burglary. The truth is over 500 children fall out of open windows every year in the U.S. The physical and emotional trauma of such an event can be crippling to the child and the entire family. If a child survives the fall, the injuries that they suffer often require surgery, long-term healing, and physical therapy. This is a high price to pay. The sight and shock of seeing their baby hurt is devastating to parents. This is the kind of guilt and pain that can't be removed. It's important to keep in mind that windows can also serve as emergency escape routes in cases of fire. While it's important for parent to learn how to reduce the risk of falls, experts warn parents not to seal their windows shut by installing bars or painting their windows shut. 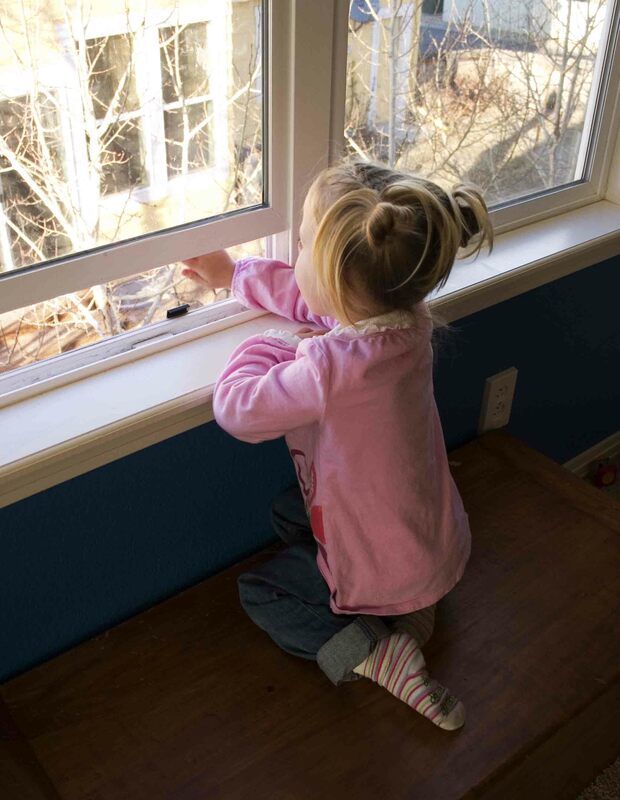 A device that allows parents to adjust their window open at a safe height, remains out of reach of toddlers, and can be quickly removed in the event of an emergency is the ideal device. Nonetheless, we all want our windows open. We want to go to the store without locking every window before we leave. We want to know that our children are safe while we're away from the house. We want to be able to sleep at night without thinking a criminal, a drug addict, or worse may crawl through the window. We want security, peace of mind, and comfort in the one place where we deserve it – our homes. The Lock-it Block-it is designed to meet those needs. A truly unique yet simple product that does what the name says it does. It locks your window open at a desired height and works to prevent burglars from breaking in. It also blocks children from falling out of open windows. It's a secondary locking device that serves as a double lock when your windows are closed. Lock windows completely shut and feel safe. Although no security device is 100% effective against crime, including the Lock-it Block-it, burglar bars make it much more difficult for burglars to force open a window. How do I keep my upright window open and securely locked at a safe height? How do I secure a device in my window and not have it fall out when the window is pulled down? How can I easily adjust my window to different heights and lock it in place? How can I be sure that this product I bought can actually deter criminals from forcing my windows open? How can I prevent my children from falling out of my open window? How can I prevent my children from reaching and removing the device? How do I do all of this without buying ugly grates and iron bars that screw into my window, deface my property, blocks my view, and makes me feel like a prisoner in my home? How can I secure my window and be able to get out in case of an emergency? The Lock-it Block-it is the perfect security bar for your windows. Below are the features and benefits that make this product much more effective than the other burglar bar on the market. What really makes this product a champion security bar and window guard is its impact strength. The Lock-it Block-it is reinforced with two types of high density polymers – ABS and PVC. This combination is stronger than the plastic casing around your windows. Two high-impact strength cylinders are locked together by a stainless double-headed push pin designed to withstand impact. Combined, the cylinders' walls are as thick as 2 nickels placed together. The copper sheeting of the Statute of Liberty is only 2 pennies thick. The Lock-it Block-it offers excellent resistance. It is strong, light, sturdy and durable. This is a product you can take with you as you move from home to home and hand down to your children. This burglar bar can take a beating. Burglars will draw a lot of attention to themselves when trying to enter a window with the Lock-it Block-it. They will have to bang the window repeatedly and make a lot of noise. Burglars don't want to draw attention to themselves. With the Lock-it Block-it you can keep you windows open at the recommended height of 3 -4 inches to deter criminals from breaking in. With the strength of this security burglar bar and the lack of leverage a criminal has because of the small opening, it makes it very difficult for burglars and criminals to climb in through your windows. Doors have locks and dead bolts. Your windows have latches - not locks. Experts recommend that we all should have secondary locks for our windows. For the best protection and effectiveness, it's recommended to use 2 devices per window. Place one device in each window track for the best security. One reason why the Lock-it Block-it is so effective at blocking burglars and criminals is because the head of the security bar fits firmly into the upper corners of the window frame. It can't be moved. This also applies to sliding windows and sliding doors - the head of the Lock-it Block-it butts ups against the side of the window frame. It can't be moved. When the bottom window comes in contact with the Lock-it Block-it, it's blocked from opening any further than where you adjusted it. The Lock-it Block-it is held firmly in place with strips of Velcro. Everyone knows how well Velcro works. In the side track or window sash, the device sticks to your window. When you lower your window, it doesn't fall out. This is the only home security burglar bar that works for upright windows without using screws and defacing your property. Everyone uses a broomstick or block of wood for their sliding doors and windows, but you can't use those for an upright window because they fall out when the window is lowered. Another reason for the Lock-it Block-it's success is that you can adjust it to keep your windows open 1 inch or more for most windows. Or you can use this home security burglar bar to lock your window completely shut. It's adjustable. Think about it, you can sleep at night with your window locked at an opening as little as 1 inch or more and you can feel safe. You choose. When you want to open the window wider, press in the push pin and make the adjustment while the burglar bar remains attached to the window. With other devices on the market, you have to either remove them or loosen them to make an adjustment. Then you have to reattach them. Each time you have to reconfirm that the device is as tight as it should be or firmly glued. Eventually, you may grow tired of readjusting those devices and not use them at all. Not so with the Lock-it Block-it. You don't remove the Lock-it Block-it when you adjust it. You just press in the push pin, slide the inner cylinder to where you want and it locks into place. Because it's a push pin, it's easy for everyone to use. It's easy for the elderly to use and people suffering with arthritis. You don't have to twist to lock. You just press and slide. The Lock-it Block-it is very easy to install. No tools are needed. This burglar bar uses Velcro to adhere it to the window's surface. Just peel off the backing from the Velcro and place the Lock-it Block-it in the window's track or against the sash. Make sure the top of the device is butted firmly against the top corner of the window. Within a matter of a few minutes the security bar will be inserted and usable. Anyone from the young to the elderly can insert the device. The Lock-it Block-it has been tested by law enforcement and Home Security experts in actual homes. They tested the Lock-it Block-it in older and newer homes. They tested the burglar bar in wood, aluminum and plastic windows. The experts found that the Lock-it Block-it fits well with all types of windows and was effective at resisting a force entry. Although they can't endorse any one product, they found a lot of promise in this product by rating it highly against other products within its category of window security burglar bar. They liked the strength of the device. Because they tested the device in actual homes, they were more concerned about damaging the home owner's window rather than the device – that's how well it withstood impact. They like the fact that it could easily be removed in the event of an emergency. And they found that it worked well in all types of single-hung windows, sliding doors and sliding windows. When presented to the Colorado Locksmith Association, the one unanimous comment was that the Lock-it Block-it was very well built. Unlike some of the other security products, the Lock-it Block-it doesn't deface your windows. Windows are the most visible structures in your home. Some of the other burglar bars require you to drill holes into your window sashes. Others require you to penetrate your windows with screws. Some of the smaller devices that screw into your windows will leave a long scare if the window is successfully forced open. All of this becomes an eye sore and an added cost to fix when you sell your home. Buyers will definitely see these defects and require the homeowner to fix them or reduce the price of the home to cover the costs of a new window. Renters may be required to pay part of their security to pay for the damage. The Lock-it Block-it alleviates those problems because no tools, drilling or screws are needed. This is hassle free protection. In addition, the top and bottom of the device is made of thick rubber. This prevents your window from being scratched when it makes contact with the Lock-it Block-it. Fires happen. You need to be able to escape through a window if your doors are blocked. If you have window guards or gratings covering your windows, those could present a dangerous situation. The Lock-it Block-it is designed to avoid this problem. In an emergency, just pull the Lock-it Block-it from the window to remove it and get out. The Lock-it Block-it is portable. Use it in different windows – just remove and replace. With each movement, be sure to secure the device properly in place and test to make sure the Velcro hasn't weakened from too much replacing. The Lock-it Block-it pays for itself and helps homeowners make money. Not many other products can make that claim. Many insurance companies provide a 5% discount for homes outfitted with dead bolts and other forms of low-tech security devices. These discounts will eventually pay for the cost of the Lock-it Block-it. Example: Two Lock-it Block-it devices costs $21.99 A 5% discount on an annual $600 insurance policy equals a $30 saving each year ($600 x 5% = $30). In the first year, the savings paid for the cost of the Lock-it Block-it. That's like getting the Lock-it Block-it for free. Every other year the home owner makes $30 because of the savings. If you own a home for 31 years, that's a $900 dollar profit for a product that cost $21.99. One of the biggest concerns for parents is the safety of their children. One of the most vulnerable areas of safety risk is open windows. Each year in the US an estimated 5,000 children fall out windows. Many are hospitalized. Some die. There aren't reports on the long-term health effects from these falls. If a child falls on his or her head, neck or back, the effects may not be evident for years to come. The Lock-it Block-it is a perfect childproof solution. Experts recommend that windows should not be left open more than 4 inches to protect children. The Lock-it Block-it can easily be adjusted to meet that requirement. The device is also out of reach from children because it's placed in the upper portion of the window. This makes it very difficult for children to reach. It's perfect for preventing children from escaping through sliding doors. The device can be adhered to the top track and adjusted for a 4 inch opening. Children can't reach it, and can't get out. It's also important to note that unfortunately many children are abducted from their homes by strangers and family members. This is a parent's worst fear. Many parents have their children's room on the second floor and falsely believe their children are safe. In some cases they may be. In some cases they're not. It's important to childproof windows even on the 2nd and 3rd floor that can be accessed from outside. Rooms over attached garages need to be secured with a burglar bar. The elderly are amongst the most vulnerable group in our society. Fiercely independent, over 10,000,000 elderly people live alone. A huge 13% of home invasion victims are over the age of 65. Those who are least able to protect themselves need a home security option to help. The Lock-it Block-it offers an added layer of home security that allows the elderly to live as they want and reduce their concerns of being victims. This burglar bar doesn't remind people of their vulnerability by locking them behind steel window bars for their protection. It's also very easy to use. A frightening and chilling fact that all women and parents need to know is that women are at risk even in their homes. Ninety million women live alone, classified as either separated or not married. An alarming 60% of all reported rapes occur to women while they are in their homes a result of a home invasion or break in. If your daughter is leaving for college, or is about to move away and brave the world on her own, equip her with the Lock-it Block-it. It's sad and scary for parents to watch their children leave the nest. It's scarier to think of the dangers that they face. Parents can't watch over their children 24/7, but they can help to protect them. Use the Lock-it Block-it as part of that protection. This will help parents worry a little less. Because the Lock-it Block-it helps people feel like they can keep their windows open, this will help to reduce the cost of running air conditioners and central air. Less pollution is emitted into the air and utility bills are less. The best way to cool a house is at night when the sun is down. Take advantage of that cool air by securing the opening of your window to allow the air to come in and cool your home. Nature doesn't cost anything and doesn't pollute. Many people aren't the slightest bit worried about leaving their windows open whether they're home or not. They don't want to be bothered with locking their windows every time they come and go. They love the freedom of having their windows open and feel perfectly safe. That kind of confidence can and has led to tragic results. Just because a person doesn't feel they are at risk, doesn't mean they aren't at risk. Over 30% of all home break-ins occur through an open window or door. On average 59% of burglaries occur while people are in the homes. The Lock-it Block-it is perfect for people with this mindset. With the Lock-it Block-it they can now set their windows open at a safe height and forget about it. They can continue to come and go as they always have but be much safer than they were. Just attach it, set it, and forget it. The Lock-it Block-it is a telescoping home security burglar bar that locks in at different lengths and withstands a lot of force. With a full extension of up to 31 inches (almost 3 feet), owners will find additional uses for the device. For instance, the Lock-it Block-it can be used to prop up older windows that can't remain open on their own. It can also help to hold up objects at a certain heights in the event that there isn't anyone around to help – like when mounting a microwave. Have a car whose trunk door no longer stays open because of bad hydraulics? Use the Lock-it Block-it to help keep the door up.